IPPL Voted Best in the West! 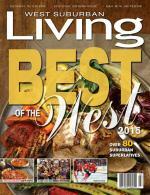 IPPL is honored to have been voted Best Public Library in West Suburban Living’s 2015 Best of the West issue. For the full list of readers’ choices in more than 80 categories, click here. Yeah! Indian Prairie is considered one of the favorite libraries in the western suburbs. The March/April 2012 issue of West Suburban Living contains its annual “Best of the West” and we made the list under “Best Public Library”. Thanks to all those who voted for Indian Prairie!